9 x 14mm Czech Glass Vintage-style Leaf – Yellow, Khaki, White - 25 qty. 4mm Czech Glass Pellet Beads - Mardi Gras - 25 qty. 4mm Czech Glass Pellet Beads - Northern Lights - 25 qty. 4mm Czech Glass Pellet – Bermuda Blue – 25 qty. 4mm Czech Glass Pearls - Vanilla - 50 qty. 4mm Czech Glass Pearls - Light Pistachio - 50 qty. 8 mm Czech Glass Pearls - Gold - 28 qty. 4mm Czech Glass Round Druks - Light Topaz - 50 qty. 4mm Czech Glass Round Druk - Opaque Brown - 50 qty. 17mm Hand-pressed Czech Glass Tablecut Dragonfly - Garnet with Travertine - 1 qty. 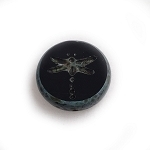 17mm Czech Glass Dragonfly - Black with Travertine - 1 qty. 5 x 14mm Czech Glass Spikes – Aqua – 10 qty.